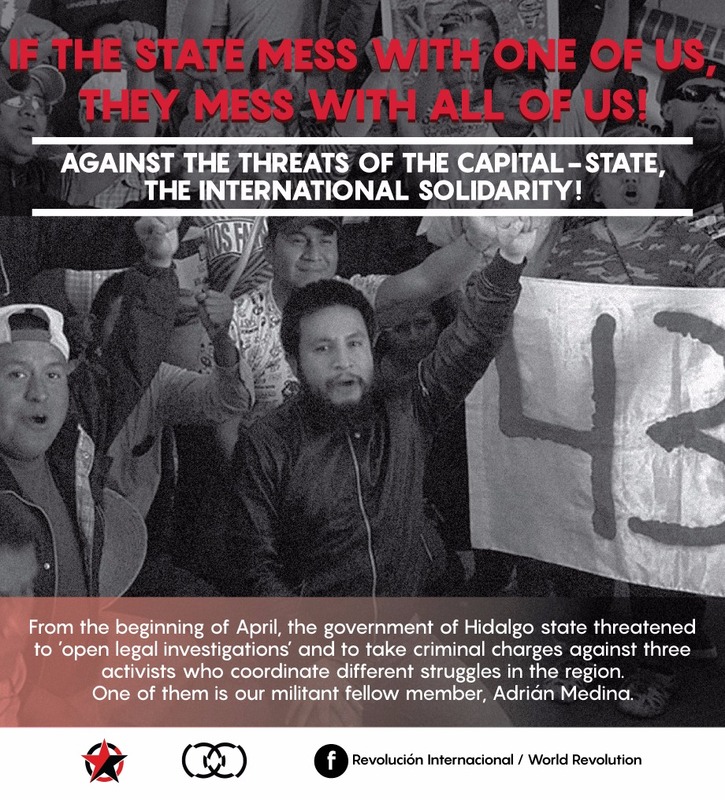 Home / Mexico / Stop the Threats of the Mexican State Against Our Militant Comrade Adrián! In early April, the state government of Hidalgo threatened to “start investigations” and take criminal actions against three militants who promote different community resistances in the region. Among them, is our brother and militante comrade Adrián Medina, criminalized in conjunction with Lorenzo Bautista and Armando Monter in many local media and newspapers to facilitate his detention or any repressive act directly against him. THE GOVERNMENT OF HIDALGO THREATENS WITH CRIMINAL ACTIONS TO OUR COMRADE ADRIAN. HELP US TO SPREAD IT EVERYWHERE! In a press conference -exclusive with the mass-media of their bunch- the Secretary of Government, Simón Vargas Aguilar, threw different accusations that surpassed the clumsy and the fallacious. Some of them -referring to the comrades- were: “they are a group of agitators who seek personal interests and put society at risk”, “they are a perfectly identified group and there will be corresponding legal actions” . The first stone was thrown by the political class, since in addition to obtaining a serie of investigations ceded by the Municipal Presidency of Ixmiquilpan and different organs of virtual intelligence -demonstrating in this way their repulsive police omnipresence in the streets and social networks- the state government is using the comrades as a media pretext to hide their cheating act of destabilizing different villages in the north of Hidalgo, where people are governed by parties “in conflict” with the PRI, by the society polarization using repressive actions such as that in Tasquillo the past April 16th. We are revolutionaries, therefore, anti-partisan and we repudiate the manipulation that the parties of any political current use to gain the machinery of representativeness and power, however, it is of great importance to denounce their plans an even more when they put at risk the integrity and the life of our militants. And… what is the perpetual harassment and resentment of the State against our fellows? Historically, Hidalgo is a PRI territory, as much by its territorial chieftains as by its safe seats that seems theater seats. It is also the cradle of the big mining and of a predatory progression of extractivist projects for centuries that violate the activities of the Earth and the Environment, affecting the life as it was known by its inhabitants. The wick of rebellion, as a body reflex, lit without premeditation. During the protest, they closed state facilities, such as the Federal Office for the Protection of the Environment (PROFEPA) and the very same State Executive Branch. – After the first ring in the New Year, the people of Hidalgo already had under their control a section of the federal highway Mexico-Laredo inside the flow of demonstrations of what was the #NoAlGasolinazo (protests against gas price hike). – On January 26, radicalness increased when the Municipal Presidency of Ixmiquilpan was taken. In the facades of that corruption palace, enormous messages were drawn with the following slogans: “PASCUAL CHARREZ KILLER / YOU FORGOT US WHO SUPPORTED YOU / RENOUNCE / NO GASOLINAZO / ALAN AND FREDY DID WHAT YOU COULD NOT, THEY DEFENDED IXMIQUILPAN “. Since its public appearance, it has turned out to be a headache for the State, so that those who are part of it -dozens of municipalities, agrarian, magisterial and popular organizations- are in constant governmental stalking due to the effective protests ranging from mass marches, take of toll booths and meetings in the whole country. – To put an end to this list of the most visible actions in the last months (because there is a whole work with the people, agitation, propaganda, massification of consciousness and organization) the last April 5, the municipality of Ixmiquilpan together with the MHCGC decided to boycott -without violence- the cowardly visit of Governor Omar Fayad Meneces to the Historical Center Square to start the police operation “Easter 2017” -with the proposal to make official the return of police force, since from January 5th the police is not welcome-. This vacation period is often visited and local spas are invaded by tourists. To the action, a lot of trailer drivers of the municipality parked around the Square to block police cars entry to Square. The media response of the State was “there were armed people and the people security would not be compromised”. The event was cancelled. The result of our threats have materialized in a special watchfulness around our comrade Adrian’s home, even the intervention of his mobile and social networks. The solidarity cannot be in other way but practice and constructive. “If you have nothing to hide, you have nothing to fear.” From April 18, a tens comrades part of the MHCGC decided to enter a collective timetable of complaints before the Commission of Human Rights of Hidalgo, not to demand through the same hydra resources and mechanisms, the much vainglorious “justice”, but to set a legal precedent that expands the margin of repression within itself. It is like a reminder at the door of the enemy that says: “HERE WE ARE AND WE ARE NOT GOING TO STOP”. Before the institutional omission, we decided to take the commission facility and to this day, more of one month of consecutive days of permanent encampment are held waiting for the corresponding authorities to face the mistaken decision to threaten the comrades. We invite all interested people anywhere in Mexico and the world to stand in solidarity with our comrade Adrian, following closely our social networks where information will be published concerning actions, campaigns and calls to support his life, latent to be outraged at any time. AGAINTS THE THREATS OF THE CAPITAL STATE … INTERNATIONAL SOLIDARITY!